It seems there’s something most Washington elected officials finally agree upon. After years of disagreement over how to tackle the worsening transportation congestion on the only two crossings over the Columbia River between Clark County and Oregon, lawmakers and their fellow elected officials appear to agree on one thing. They don’t want Oregon lawmakers to succeed in their plans to place tolls near the border between the states on both the I-5 and I-205 corridors. 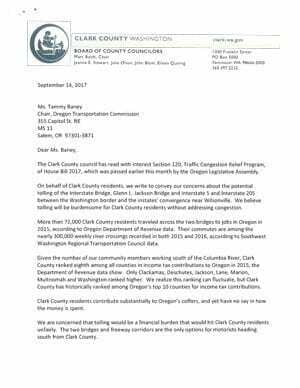 Among those who have made their opinion on the subject known recently are the members of the Clark County Board of Councilors, who collectively penned a letter to Tammy Baney, the chair of the Oregon Transportation Commission. The letter, dated Sept. 14, 2017, is signed by all five councilors. Gov. Inslee response to re-tolling between WA and OR. Click to open PDF. “The Clark County council has read with interest Section 120, Traffic Congestion Relief Program, of House Bill 2017, which was passed earlier this month by the Oregon Legislative Assembly,’’ the councilors’ letter reads. “On behalf of Clark County residents, we write to convey our concerns about the potential tolling of the Interstate Bridge, Glenn L. Jackson Bridge and Interstate 5 and Interstate 205 between the Washington border and the instates’ convergence near Wilsonville. We believe tolling will be burdensome for Clark County residents without addressing congestion. “More than 72,000 Clark County residents traveled across the two bridges to jobs in Oregon in 2015, according to Oregon Department of Revenue data,’’ the letter states. “Their commutes are among the nearly 300,000 weekly river crossings recorded in both 2015 and 2016, according to Southwest Washington Regional Transportation Council data. “Given the number of our community members working south of the Columbia River, Clark County ranked eighth among all counties in income tax contributions to Oregon in 2015, the Department of Revenue data show,’’ the letter continues. “Only Clackamas, Deschutes, Jackson, Lane, Marion, Multnomah and Washington ranked higher. We realize this ranking can fluctuate, but Clark County has historically ranked among Oregon’s top 10 counties for income tax contributions. Oregon Transportation Commission, Tolls. Click to open PDF. 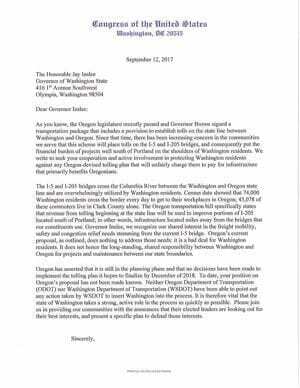 The councilors’ letter comes after efforts by U.S. Representative Jaime Herrera Beutler to also fight against Oregon’s plans to toll Washington drivers. Earlier in September, Herrera Beutler successfully secured a legislative amendment to prohibit Oregon’s proposal. Herrera Beutler introduced the prohibition on the U.S. House floor as an amendment to a U.S. House funding plan for the U.S. Department of transportation, the federal agency that must approve Oregon’s tolling plan. “Residents of Southwest Washington have been voicing their strong concern to me that Oregon will be forcing them to pay tolls for infrastructure they don’t use and that there’s nothing they can do about it. They’re concerned that Oregon will make them an unwilling piggy bank,” Herrera Beutler said. “Tonight I went to the floor of Congress to defend them against unfair tolls, and I’m pleased that the U.S. House passed my plan to do just that. I’m not against the concept of a user fee as long as it’s used to construct or repair something that benefits those who pay, and my amendment does not prohibit that from happening. It does not prevent Oregon or Washington from improving the I-5 bridge; it simply protects against Oregon’s skewed plans to make Washington commuters pay unfair tolls for infrastructure projects that are miles away from the Columbia River, offering little benefit to Southwest Washington residents. 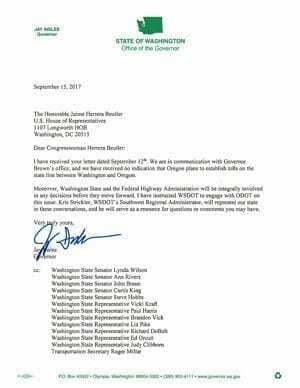 New Tolling Inslee Letter. Click to open PDF. Herrera Beutler also sent a letter to Gov. Inslee on Sept. 12. The letter was also signed by nine Republican state lawmakers — Sen. Ann Rivers (18th District), Rep. Vicki Kraft (17th District), Rep. Brandon Vick (18th District), Rep. Liz Pike (18th District), Rep., Ed Orcutt (20th District), Sen. John Braun (20th District), Rep. Paul Harris (17th District), Rep. Richard DeBolt (20th District) and Sen. Lynda Wilson (17th District). “We write to seek your cooperation and active involvement in protecting Washington residents against any Oregon-devised tolling plan that will unfairly charge them to pay for infrastructure that largely benefits Oregonians,’’ the letter states in part. Gov. Inslee offered a letter in response to Herrera Beutler that included a rather puzzling statement, which Herrera Beutler, rightfully, later challenged. Talk about bad intelligence. Anyone paying any amount of attention to this story over the past several months is painfully aware of Oregon’s plans. But, I’m not going to let Gov. Inslee’s confusion lighten my enthusiasm for the fact that, finally, there appears to be a groundswell of opposition to Oregon’s plans. As Herrera Beutler stated, now it’s time for Sens. Murray and Cantwell to firmly get behind the effort to block Oregon’s plans at the federal level. I offer my sincere appreciation to all the elected officials who have joined arms to fight Oregon’s plans. I hope this collaboration will lead to more agreement in the future on how to tackle our critical transportation congestion issues.